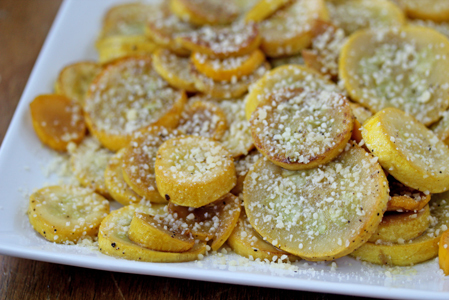 Caramelized Yellow Squash with Parmesan – Grow. Eat. $ave. Growing up, I have vivid memories of my mom putting a casserole dish filled with yellow squash and some water in the microwave to steam. Then when it was done, she would sprinkle some Parmesan on top and set it before us on the table. It never got too many complaints…at least not from me, and not from my brother and sister, if my memory serves me right. It’s a running joke in our family…my mom didn’t cook when we were growing up and we still can’t figure out what happened with me. I cook at least 6 nights a week. Without complaining. I *big puffy heart* cooking. What really happened is that the cooking gene skipped a generation and was passed down from my mom’s mom right on to me. So I’ve taken the concept of my mom’s steamed squash with Parmesan and kicked it up a few notches here with this caramelized yellow squash with Parmesan on top. Add the olive oil, sugar and some salt and pepper to a large skillet and warm the oil. Drop the sliced yellow squash into the hot skillet, then turn down the heat to medium. Toss the squash around until they get brown in color, about 5 minutes. Then reduce the heat again to low and let caramelize for another 10-15 minutes, tossing often. Slide the caramelized squash onto a serving dish and sprinkle the Parmesan cheese on top. Do you have a yellow summer squash recipe to share?! Feel free to link up your blog post below…or leave an update in the comments!!! I’m going to try this- I’m picking my first yellow squash today! I think this would be really good with onions too. I cook my squash the same way but with thin-sliced onions as well (and sometimes zucchini). It’s delicious! I’ve never had it with parmesan but it sounds good! This sounds delish! I’ll have to try it. Sadly, I’m the only one in my house that will eat squash. My mom always cut the yellow squash into small chunks and cooked it in a little oil with lots of black pepper. It’s one of my favorite summer foods! Such great timing, I was JUST looking for ideas for yellow squash–my plant is making TONS more then my zucchini plant right now! Think I can shred it up like zucchini and put it in bread? I should add one way we love to use squash, zucchini and onions is to slice each in half or quarters, brush with olive oil and grill them on the grill for a few minutes on each side. Then let cool for a minute or two, cut into bite size pieces and mix with salt and pepper. Its become my new side for cookouts. Would this work with other veggies? It would work well with zucchini and eggplant. Just sweat the eggplant first. And likely others too. Love yellow squash! It’s so pretty; particularly love it roasted with a little olive oil, cumin, salt, pepper and lime. Yum! My daughter HATES squash but LOVED this recipe! It was delicious! Thank you for the great suggestion and getting her to eat squash!